I've been asked a number of times what plants were used in establishing the raingarden on Harrison Street just south of Hamilton Ave. The garden was designed and installed by Curtis Helm, with some help from me. Plants were donated by Curtis' friends at Pinelands Nursery. This photo was taken at the end of June, just as the tall Joe-Pye-Weeds and smooth oxeyes (yellow) were starting to bloom. The garden was densely planted several years ago with about 330 plants--ten each of two kinds of ferns, 7 shrubs, and about 25 each of various wildflowers, sedges, rushes and grasses. There are many other species that can be used, but these have worked well together. Hardest hit during this summer's drought were the monkey flowers and ferns. 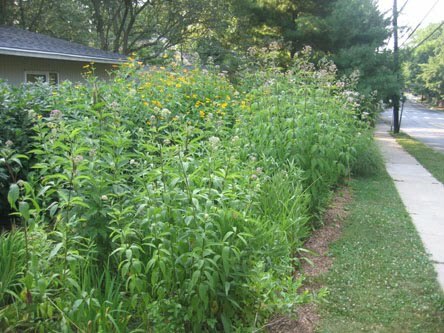 Swamp milkweed (Asclepias incarnata), turtlehead (Chelone glabra), Joe-Pye-Weed (Eupatorium maculatum), Sweet smooth oxeye (Heliopsis helianthoides), Blue flag iris (Iris versicolor), soft rush (Juncus effusus), Cardinal flower (Lobelia cardinalis), Great lobelia (Lobelia syphilitica), Monkey flower (Mimulus ringens), Sensitive fern (Onoclea sensibilis), Cinnamon fern (Osmunda cinnamomea), Switch grass (Panicum virgatum), Woolgrass (Scirpus cyperinus), seaside goldenrod (Solidago sempervirens), and Virginia sweetspire (Itea virginica). Most of these can be found growing wild in the Princeton area, with the exception of oxeye, seaside goldenrod and Itea virginica. Spreading slowly through Herrontown Woods, and also Community Park North, is an unusual plant with spines and three-foot long leaves. This time of year, its large inflorescence offers black berries to the avian world. 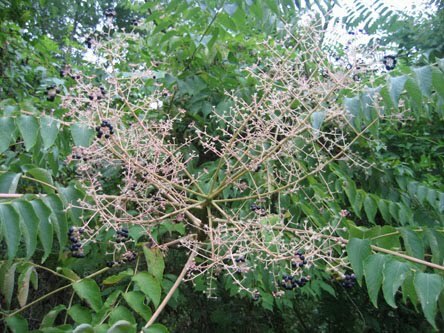 I had been pleased to call it Devil's Walking Stick (Aralia spinosa), a native to the eastern U.S., but have learned that it's more likely Japanese angelica tree (Aralia elata). It is especially well established near the Herrontown Woods parking lot in an area where many mature pines blew down this year. 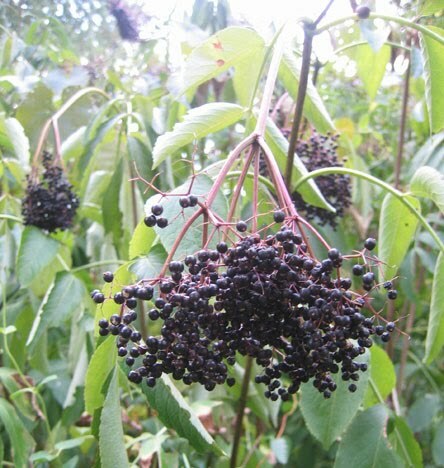 "Timothy Block of the Morris Arboretum near Philadelphia wrote: Aralia elata (Japanese angelica tree) is very prickly and becoming common in the woods .... This plant is a rapidly spreading invasive. 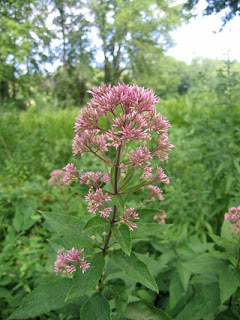 In most cases, it was formerly misidentified as Aralia spinosa (devil’s-walking-stick) which is native to western and central PA and widely cultivated. The only completely reliable way to tell the two species apart is by the structure of the inflorescence. Aralia spinosa (the native) has a pyramidal inflorescence with a long central axis, while the inflorescence of Aralia elata (the Asian species) has a short central axis attached to which are long branches, giving the inflorescence the appearance of a fireworks burst. In both cases, the inflorescence may be three feet or more across, bearing thousands of flowers and fruits. The seeds are bird-dispersed." About a dozen of us congregated this past Saturday morning for a nature walk along the canal towpath, using our collective wisdom to interpret the myriad sorts of plant life we encountered. The leaves of Ailanthus and sweet gum were crumpled, and words sought to characterize their aroma. Great respect was given to poison ivy, where it had climbed trees and sent out lateral branches terminating with this year's crop of berries. I pointed out the wings on winged sumac, the flowers on ironweed, cutleaf coneflower, hibiscus and JoePyeWeed (first photo), and the switchgrass that George W. Bush embraced in one of his State of the Onion speeches as the biofuel of the future. Where the land between the canal and Carnegie Lake widens towards Harrison Street, we gazed out across rich undergrowth flourishing beneath scattered oaks, and talked of how low-level fire--the Indian's horticultural tool-of-choice--once fashioned landscapes much like this. 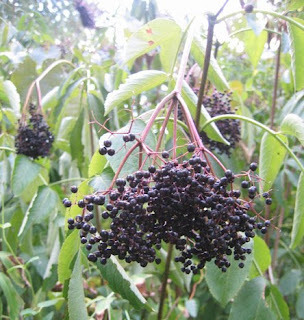 The open canopy allows native shrubs like elderberry (photo) to thrive. We (which is to say my parents) used to make pies and jelly out of these. Sometimes the birds pick them clean, sometimes they don't. Looks like a good crop this year. 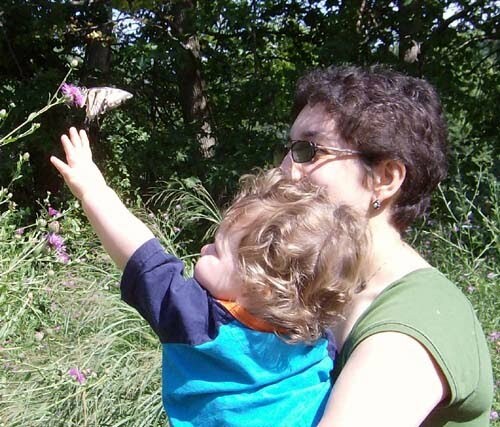 The abundant tiger swallowtail butterflies were out and about, drawing the attention of our youngest participant. When asked what a certain 3 foot tall plant was, I took a closer look and found that it was a collage of four species all tangled up in their scramble for sunlight. Such is the diversity when you put water and sun together. 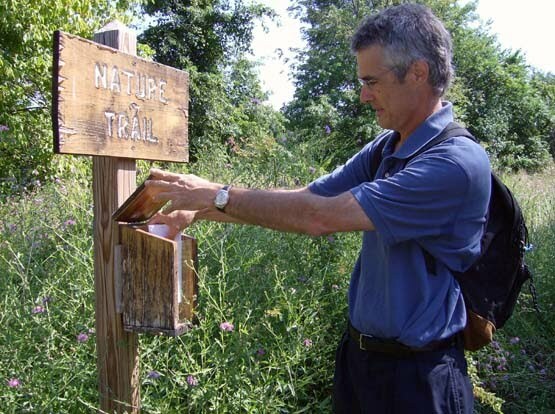 And, in a solemn event at the Harrison Street end of the walk, Jim Manganero photographed my ceremonial "finally getting around to putting some plant info in the brochure box that a boy scout so nicely built several years ago." I guess I wanted to make sure the box was going to withstand the test of time before putting it to use. Thanks also to Jim for the previous "To touch a butterfly" photo. A movie about ditching the tractor in favor of a horse-drawn plow will be showing this Friday at Howell History Farm. More info at www.princetonproject.org, and on the Howell History Farm website.